Want to cut down on lunchtime waste? Please consider reducing the amount of lunchtime waste your family generates. Think about what you can do to cut down on waste. Here are a few suggestions for getting started. •Pack a cloth napkin instead of a paper napkin. •Pack stainless-steel utensils instead of using disposable plastics. •Pack a reusable drink container instead of disposable juice boxes, juice pouches, cans, and plastic bottles. •Pack lunch items in reusable containers. Laptop Lunches work well because they allow for an appealing horizontal presentation. Avoid using plastic wraps, plastic bags, wax-paper bags, and aluminum foil. •Avoid purchasing pre-packaged items. Buy foods in larger containers and leave them at home for recycling. •Pack lunches in a lunch box or backpack instead of relying on paper or plastic bags. 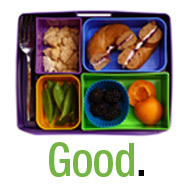 Tell your friends, or better yet, start a waste-free lunch program at your school! Check out www.wastefreelunches.org for information on how to get started.